It’s hot in the Vuelta. Many riders are reporting temperatures well above 40°C (104°F), that’s because the tarmac heats up which in turn warms the air. Oscar Freire reported 49°C. As you’d imagine, riders need to drink a lot. Spanish sports website AS says some teams emptied three ice boxes of 80 bottles each, meaning 240 bottles in total… or some 26 bottles per rider. Talking of thirsty work, Australian rider Johnnie Walker is making a name for himself in the Vuelta, thanks to the homonymous whisky brand. Speaking to the Spanish media in fluent Castillan, Walker jokes about his name saying he sometimes tells riders his middle name is “Coca Cola”. Personally I’m just waiting for him to win one day so I can use the headline “Johnnie Walker’s smooth finish”. Johnnie’s following in the steps of older brother of Will. Will Walker suddenly emerged in 2006 when he won the Austrlian road race title ahead of the bigger names, only he couldn’t wear the green and gold jersey because he was technically only the U-23 champ, despite being the big name pros on the day. 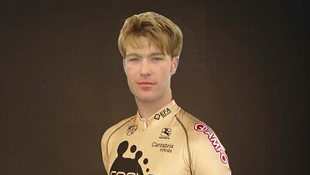 He was snapped up by Rabobank then moved to Fuji-Servetto, which is how Johnnie got his ride. Sadly Will had to quit the sport because of heart problems but he’s the Malaysian coach and recently married to Aldo Sassi’s daughter.